Debenhams call in KPMG to assess future options. Debenhams call in KPMG to assess future options - in order to cut costs and boost sales in their stores. The move is part of the chain's turnaround plan - to cut costs and boost sales in their stores across the UK. One of the main options Debenhams are looking into is a CVA (Company Voluntary Agreement). A CVA is an agreement a company can make when they are insolvent, or in debt, to pay their creditors off in payments over a fixed period - in which, creditors can agree or disagree to the decision. More importantly, if they agree, the company can continue trading under the same conditions. KPMG, the company who have been brought in to 'turnaround' Debenhams, is a financial auditing company. They also provide services in accounting, tax and advisory services. They are similar to companies such as PriceWaterHouse Cooper (PWC) and Deloitte. 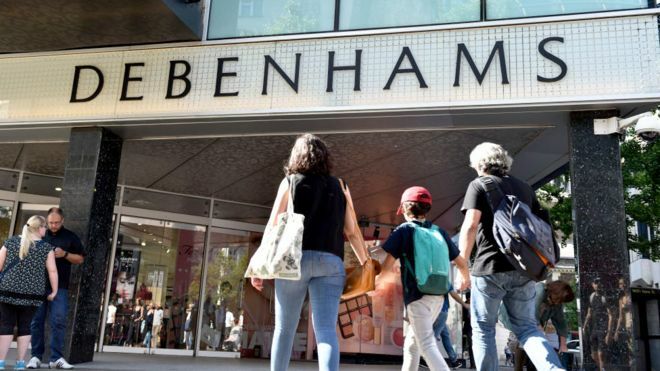 They will be running an audit on Debenhams to see where they can cut costs and boost sales. But both companies, have acknowledged that the high-street market in the UK at the moment is "challenging" after the rise of e-tailers such as Amazon - which has also seen other companies such as Toys R Us fall into administration and completely fall off the face of the high street. However, there has been multiple financial warnings this year - so this isn't the first time Debenhams have been aware of their struggles. One part of their 'cost-cutting plan' is to cut around 80 to 90 head office jobs and around 320 store jobs throughout the UK. They are also looking to raise some quick cash by selling their Scandinavian store, Magasin du Nord, for up to almost £200m it is thought. Within the last 5 days, their share price has also fluctuated quite violently, more so overall going down. However, the share price crept up +0..67 (5.52%) on Friday 7th September following an announcement of hiring financial auditors, KPMG. Debenhams current share price is 12.80. I hope they don't go into administration... I have about £150 in Debenhams gift cards!